Multimedia in an Aluminum Skin. 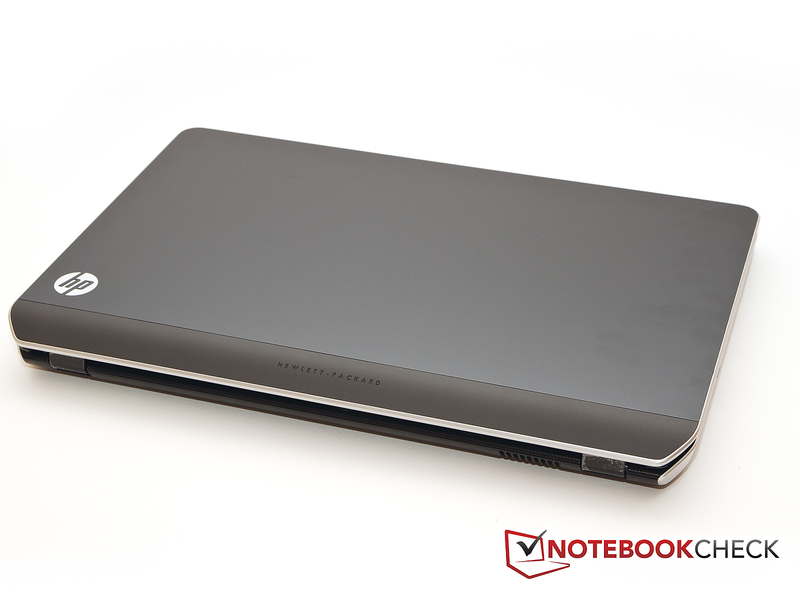 The HP Pavilion dv7 is a multimedia notebook available for less than 800 Euro (~$1035). Although, the buyer might not get the newest hardware, they should be happy with the nice aluminum case. 17-inch multimedia notebooks are quite popular. These laptops are often used as desktop replacements as they require less space and are easier to transport. Buyers looking for such a 17-inch model with fast hardware will quickly find themselves on the HP homepage looking at the Pavilion dv7 series. 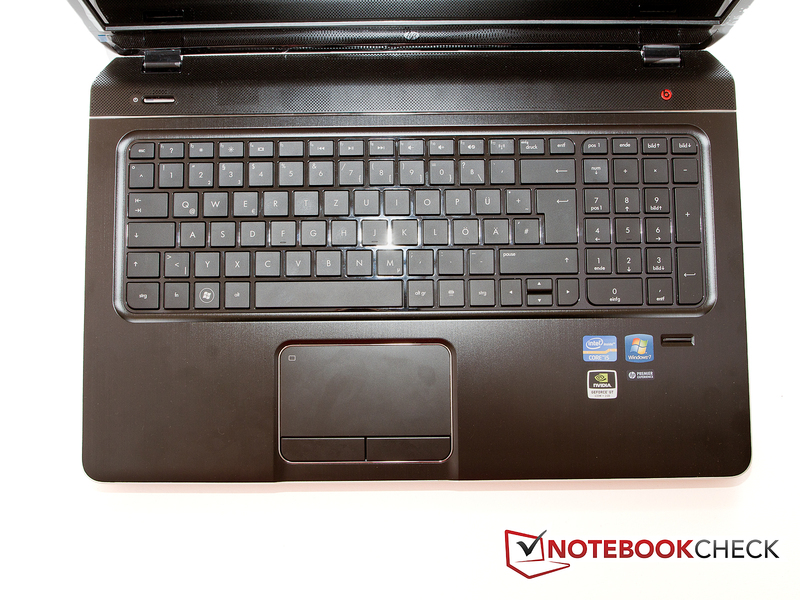 In this review, we will test the HP Pavilion dv7-7000sg. This laptop is priced below 1000 Euro (~$1300), and offers a 17-inch screen with a dedicated Nvidia GeForce graphics card, an Intel Core i5 CPU and sufficient RAM and hard disk space. However, the buyer will not receive a Full HD screen or a Blu ray drive. 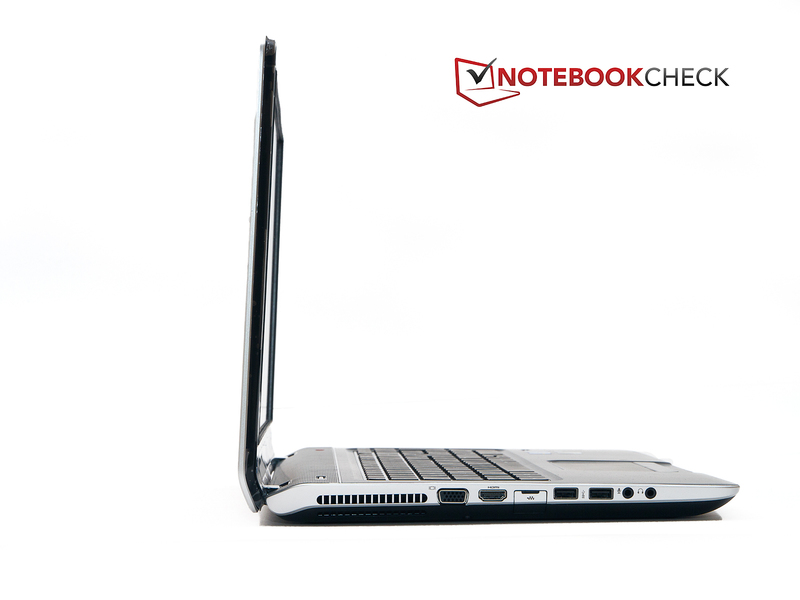 Read on to find out how the laptop performs in our test. Our test model has a slightly different look from the previous models of the dv7-6xxxx series. As expected of a Pavilion dv7 model, HP uses a lot of aluminum. This makes the model look and feel nice, and aluminum is much sturdier than synthetic material. The aluminum surfaces look as if they were lightly brushed, which gives them the typical "grooved" structure. The matte black finish looks very nice and high-quality, without being too thick. Sadly, the surface is not resistant to fingerprints. So the buyer will have to occasionally take a cleaning cloth to their laptop. HP continues the design on the inside. Matte black aluminum surfaces cover the base and this helps make the laptop sturdy. For example, the hand-rest regions are quite strong and do not budge under force. The keyboard does give way a little under modest pressure. The stiffness of the display is medium. The large screen can only be partially opened with one hand. After a certain angle (around 40 degrees), it pulls the base of the laptop upwards with it. The positioning of the ports on our test model is quite similar to that of previous dv7-6xxx models. The interfaces are distributed on the left and right sides. The majority of them can be found on the left side. On the right side, the laptop offers the optical drive, power in, and two USB interfaces. The positioning of the interfaces is not optimized to reduce the mess of cables, which appears when multiple peripherals are used. In short, the positioning can be described as such: the ports for stationary use (Power in, VGA, HDMI) are put further back, whereas the USB ports are placed more forward. 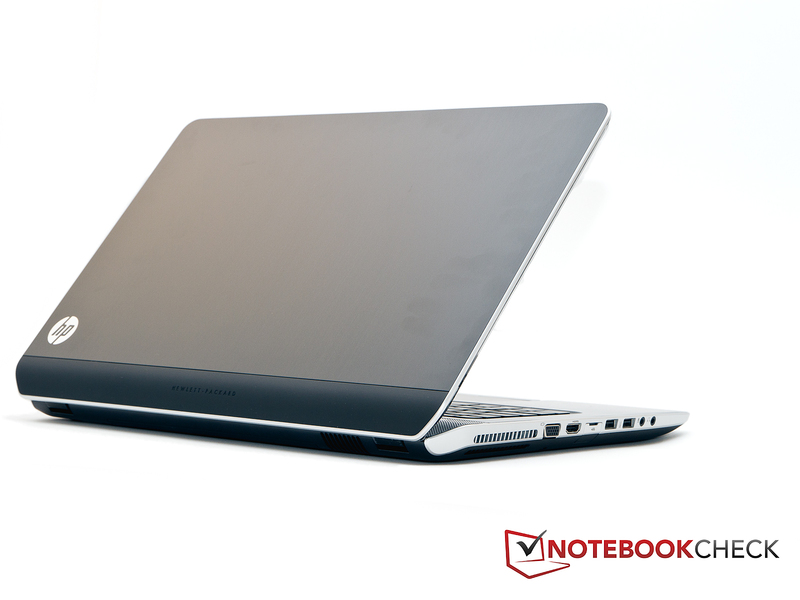 The HP Pavilion dv7 offers everything that is expected of a multimedia notebook. For those, who wish to use the laptop as a desktop replacement, a RJ45 LAN interface is provided that supports 10/100 and 1000 Mbit/s datatransfer speeds. For those users who wish to be more flexible, the WLAN module offers the freedom to surf on the web without any cables. Even those users, who wish to reduce the number of cables on their desktop, by using a wireless mouse will be pleased with this model as it has Bluetooth on-board. Although it's not a business notebook, the HP Pavilion dv7 still has a few security mechanisms like the fingerprint reader which can also be used in certain websites instead of passwords (but restricted to certain browsers) which is a nifty feature. A maintenance flap is installed and secured by a single screw. 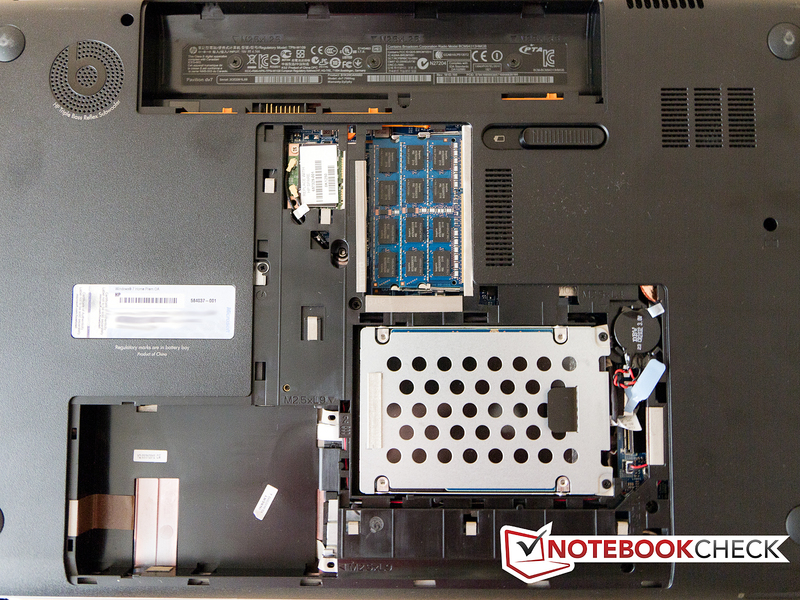 The user can easily access the majority of the hardware in the laptop after removing this flap. This makes upgrading or swapping out the RAM and hard disk a possibility. There is even a second slot for a secondary hard disk. It would be possible to install another hard disk in this slot if a cable were provided. However, this was not the case in our test model. The cooler fan is not accessible. HP offers a 24 month pick up and return service for the Pavilion dv7. HP has chosen a chiclet keyboard with a numeric pad for the Pavilion dv7. Each key measures 15 x 15 millimeters. The gap between two keys is 4 mm. This should ensure sufficient space for typing even for users with big fingers. The gap between the keys ensures accurate typing. The stroke distance is quite comfortable and neither too long nor too short. The impact is a little too soft. The typing noise is very quiet. Overall, the keyboard works very well. The flexing of the keyboard, which we discussed earlier, is not an issue while typing. 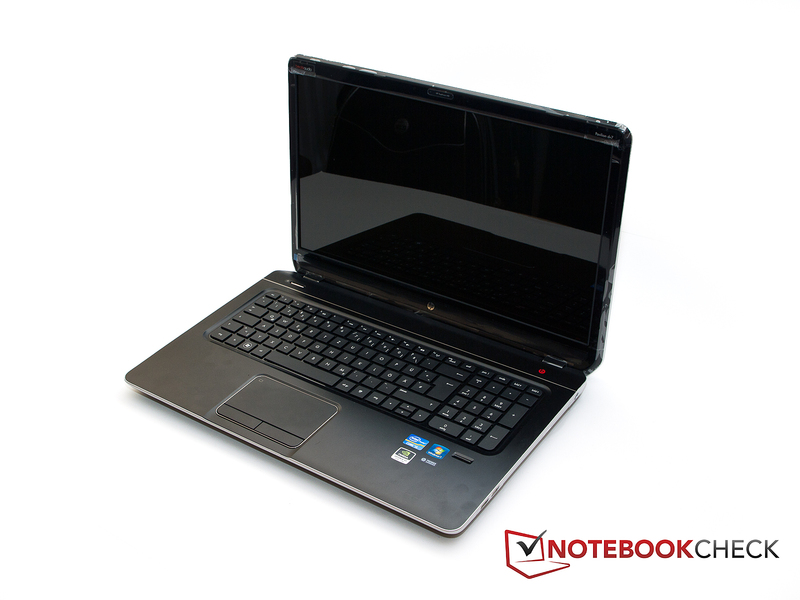 HP has not provided any special keys for the Pavilion dv7. The only special button is the on/off button above the keyboard. All other functions have been relegated to the Fn keys. Other special features like water-proof coating or backlight are not provided. The touchpad impressed us right from the get go. HP has employed a matte black surface which is slightly roughened. The touchpad measures 105 mm x 55 mm (115 mm diagonally) and is quite big. Multi-touch gestures such as scrolling with two fingers are recognized without a problem on this touchpad. In addition, HP has clearly fenced off the touchpad from the hand-rest regions with an additional border and recessed it. Thus, the user will automatically know when s/he has left the touchpad. Both mouse keys work well. The pressure point is clear and when pressed, the buttons emit a clear and distinct click. The stroke distance is quite short, but this should not be a problem as the pressure point is well defined. A good display is a must for a multimedia notebook. HP has picked a 17.3-inch panel for the Pavilion dv7. The resolution of the display is called HD+ (1600x900 pixels) as it lies between HD (1280x720) and Full HD (1920x1080). The LED backlight is standard nowadays. In addition, the LEDs ensure a homogenous illumination of the panel. Sadly, a Full HD display did not make the cut for our test model, but it would have looked nice on the dv7 (see the 7002eg). On paper, the display is very promising, and our measurements are quite close to the values provided by HP. The display has an average brightness of 231.9 cd/m2 which is a solid number. There are other laptops with higher values but one should not ignore the maximum brightness which is quite close to the average at 239 cd/m2. 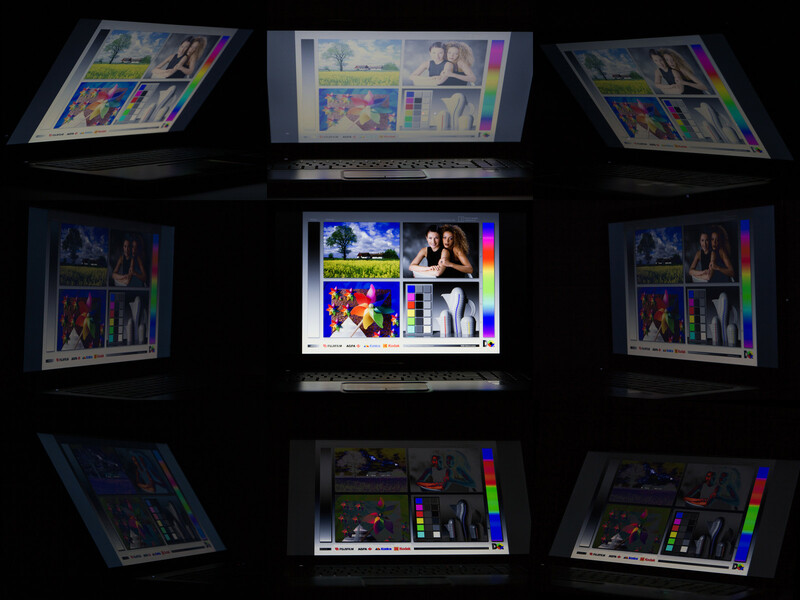 A look at the brightness distribution reveals that the screen has nearly perfect illumination of 95%. This is almost a record. We are also happy that the brightness does not drop during battery use. Sadly, the contrast is a modest 176:1 due to a relatively high black value of 1.35 cd/m2. We expected far better values due to the great numbers we measured earlier on. The color coverage is not exceptional. The sRGB color space is not completely covered by the panel. There are also big differences in the larger AdobeRGB space. 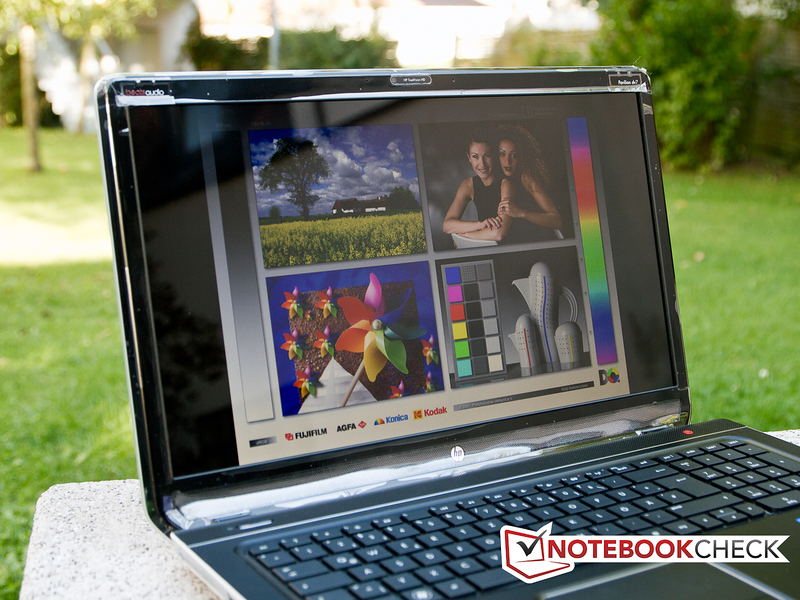 A multimedia notebook does not need to have great coverage. This is only of import to professional picture and video editors, and very few of those will want to use a multimedia notebook for their work. The accurate depiction of colors is not very important in the everyday use of a multimedia laptop. Outdoors, the display is a problem. The reflective screen can be hard to read. In the shadows, the user will face annoying reflections and in the sunlight, the screen is not clear enough to read. The viewing angles of the HP Pavilion dv7 are similar to those of other consumer and multimedia laptops. As long as the user looks at the display without bending it too much, the picture remains recognizable (even from the sides). However, as soon as the screen is tilted forward or backward, the clarity quickly drops. 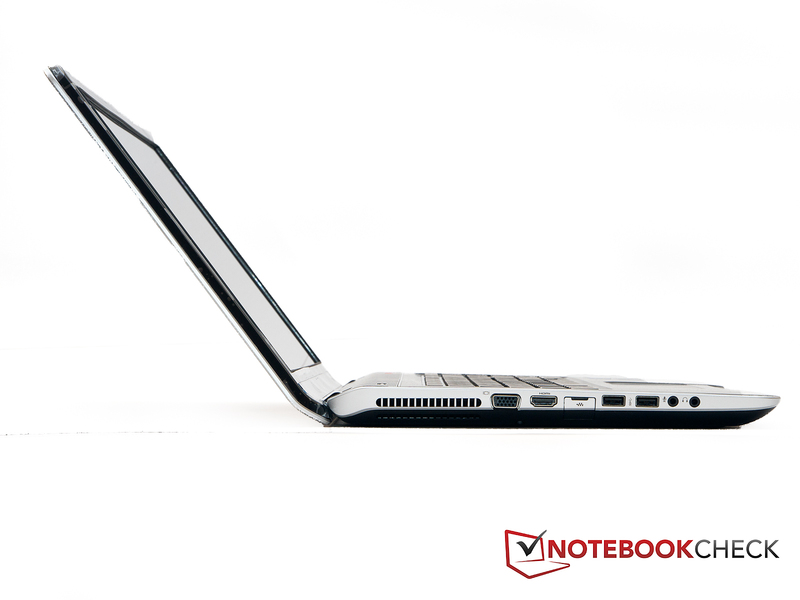 The HP Pavilion dv7 is a multimedia notebook and so it must be able to play movies. As many users want to run movies on their TV via HDMI at a Full HD resolution, the laptop must have sufficient performance reserves. This is not a challenge for the Pavilion dv7 thanks to the Intel Core i5 CPU and the Nvidia GPU. The notebook is also suited for office tasks and streaming videos off the web. The occasional gamer should be satisfied with this model, as long as the games are not run at the highest resolution or highest details. The installed Intel Core i5-2450M is not the latest processor and belongs to the Intel Sandy Bridge series. The next generation, Ivy Bridge, is already available. The i5-2450M is a middle-class processor with two cores. Thanks to Intel's Hyperthreading technology, the CPU can process up to 4 threads simultaneously. The maximum clock speed of the processor is 3.1 GHz. However, this is only possible when a single core is doing all the work. When multiple cores are running, the maximum clock speed drops. The Sandy Bridge processor in the DV7 has a 35 W TDP. We used the CinebenchR10 und R11.5 benchmarks to gauge the performance of the Pavilion dv7. The following tests are 64 bit. In Cinebench R10 Rend. Single, the HP Pavilion dv7 scores 4895 points. This test only takes one core into consideration, thus the dv7 performs quite well. Other notebooks, with the same processor like the Sony Vaio VPC-EJ3D1E/W (2450M, GeForce 410M), score at a similar level (4883 points). The dv7 is slower than the new Ivy Bridge processors. This is shown by the MSI GE70-i547W7H (3210M, GT 630M), which scores 5183 points. In Cinebench R10 Rend. Multi, all available cores are tested. The dv7 scores 10320 points in this test. The test model once again lies at the same level as other laptops with the 2450M CPU. The Sony Vaio VPC-EJ3D1E/W (2450M, GeForce 410M) scores 10518 points (which is slightly worse than the DV7) in this test. In comparison, the Ivy Bridge CPUs have not changed much. The MSI GE70-i547W7H (3210M, GT 630M) may not be one of the fastest notebooks with Ivy Bridge, yet it can still score 10924 points which is more than the Pavilion dv7. In the Cinebench R11.5 benchmark, our test model follows a similar trend. Compared to other models which use the Intel i5-2450M CPU, the Pavilion dv7 performs at a similar level. However, against processors of the newest Ivy Bridge family, our test model is at a disadvantage. We did not notice any irregularities during "normal" use with Turbo Boost. The CPU clock speed remains constant at its specified value. This is not the case in a full load situation. HP has taken measures to prevent the CPU from overheating. Additional information about these measures can be found in the section "Temperature". The system performance is measured using PC Mark Vantage and PC Mark 7. In PC Mark Vantage, the Pavilion dv7 wrings out a score of 7161 points. This places it next to the Packard Bell EasyNote LS11HR-167GE (2450M, HD 7670M) with 7082 points and the Asus N76VM-V2G-T1078V(3610QM, GT 630M) with 8584 points. In PC Mark 7, the test model scores 2059 points. Once again, the test model places in front of the Packard Bell EasyNote LS11HR-167GE (2450M, HD 7670M) which scores a modest 1991 points. The Asus N76VM-V2G-T1078V (3610QM, GT 630M) takes the lead with 2469 points. Overall, the dv7 offers good performance which is to be expected with this hardware. The hard disk of the Pavilion dv7 is a 2.5-inch model with a capacity of 650 GB. This is not much for a multimedia notebook, but sufficient for most users. The hard disk operates at 5600 rpm. It is clear from the specifications that this Hitachi hard disk is not the fastest in the business. The average transfer speed is 70.6 MB/s, which is not exceptionally high and the access time is quite slow at 20.9 milliseconds, even for a hard disk running at 5400 rpm. To see how this hard disk performs in comparison to other hard disk or even SSDs, take a look at our HDD/SSD benchmark table. The HP Pavilion dv7 has two GPUs at its disposal. The first one is the Intel HD Graphics 3000 chip. This is found integrated in the processor and does not increase the power consumption by much. It is well-suited for surfing on the Internet or watching videos. The Nvidia GeForce 310M is comparable to the HD 3000 in terms of performance. Should more graphics performance be required, the system will automatically switch to the stronger graphics card, the Nvidia GeForce GT 630M, thanks to Nvidia Optimus technology. This is a middle-class graphics card which can run most new games at low settings. However, at medium settings or higher resolutions the gameplay breaks down significantly. The laptop can only run older games at high settings. We used 3D Mark 06 to measure the graphics performance. The HP Pavilion dv7 scores 9069 points. 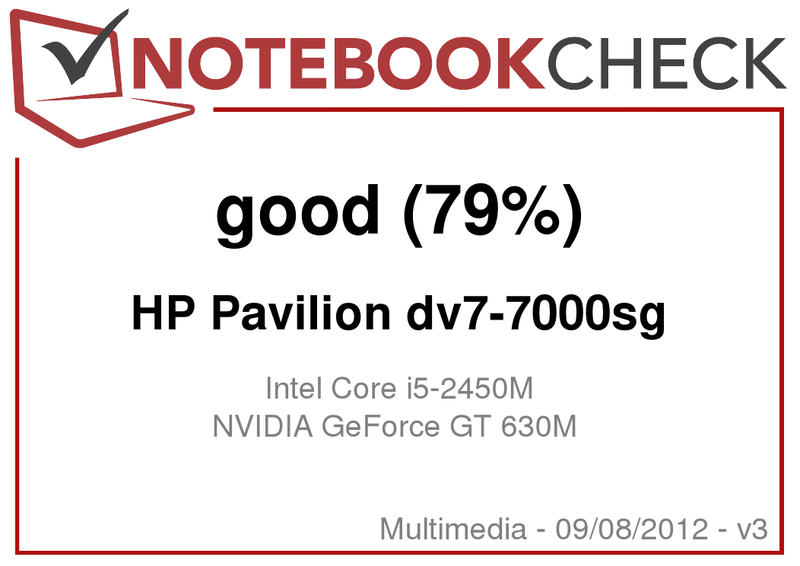 In comparison to other notebooks which use the GeForce GT 630M, the HP Pavilion dv7 scores quite well. 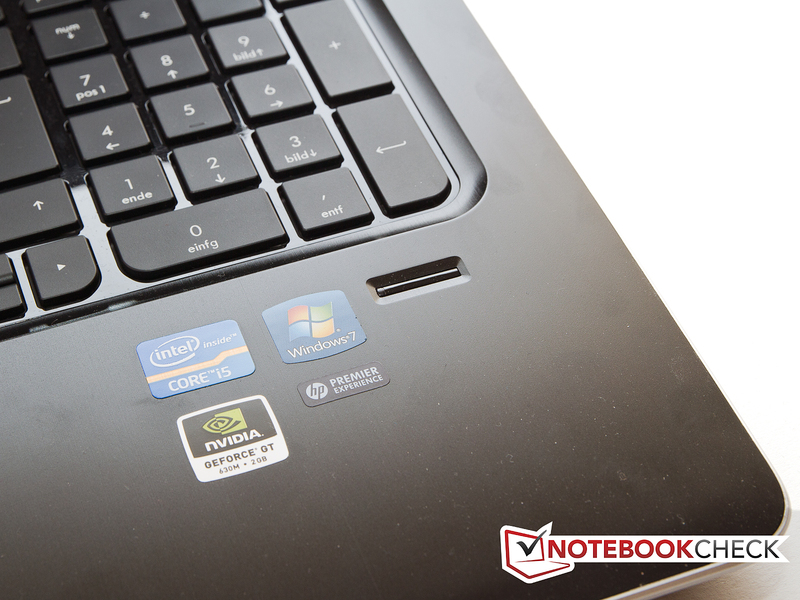 The next notebook with the GT 630M is the Asus A95VM-YZ030V (3610QM, GT 630M), which scores 9593 points. This Asus model is an 18-inch desktop replacement. 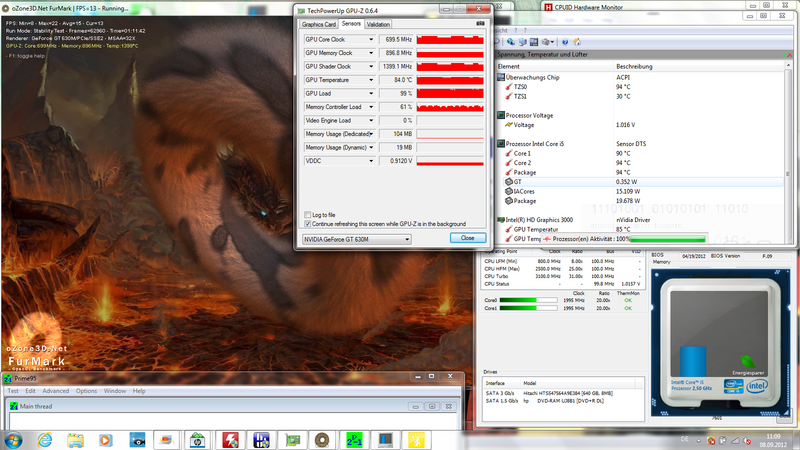 The previously-mentioned Asus N76VM-V2G-T1078V (3610QM, GT 630M) manages 9503 points in this benchmark. In 3D Mark 11, the dv7 cannot score as well. The score of 1249 points places the test model behind the Asus N76VM-V2G-T1078V (3610QM, GT 630M) which manages 1288 points. Despite this, the graphics performance of the dv7 is decent. The reason why the graphics card performed so well in our benchmarks is because it operates at higher clock speeds. We logged the speeds of the card at load and then analyzed the data. The clock frequency of the core lies at around 800 MHz at load. The memory speed lies at 900 MHz and the shader frequency lies at 1600 MHz. All these clock speeds are higher than those specified by Nvidia. While playing games, the user will quickly realize that the GeForce GT 630M is a mere middle-class graphics card. In Battlefield 3, the graphics card just cannot keep up. However, other games are run fluidly by the card, which means that even the occasional gamer will be happy with the HP Pavilion dv7. To see how the Pavilion dv7 graphics card performs with additional games, take a look at our large benchmark list. When it comes to noise emissions, the Pavilion dv7 is quite reliable, at least during low load. 33.2 dB (A) to 34.7 dB(A) are bearable noise levels measured in these conditions. The noise level and frequency are not uncomfortable, which means there are no buzzing capacitors or other distracting noises. At load, the emissions rise and reach 45.4 dB (A) to 45.6 dB (A). At this level, the notebook is clearly audible and almost distracting. Watching a film on this 17-inch model will require the viewer to come to terms with an emission of 37.4 dB (A). The optical drive may not be the quietest, but it is less conspicuous than the drives found in most notebooks. Although the HP Pavilion dv7 is "only" equipped with an i5 processor, the case can get quite warm at load. We measured up to 55.8 degrees Celsius on the bottom of the laptop. The top can reach a maximum of 43.7 degrees Celsius which is cooler in comparison. The cool hand-rest regions are a definite plus. These only get slightly warm to touch. While idle, the temperatures can be ignored. The top remains below 30 degrees Celsius and the bottom of the laptop reaches a maximum of 32.7 degrees Celsius. 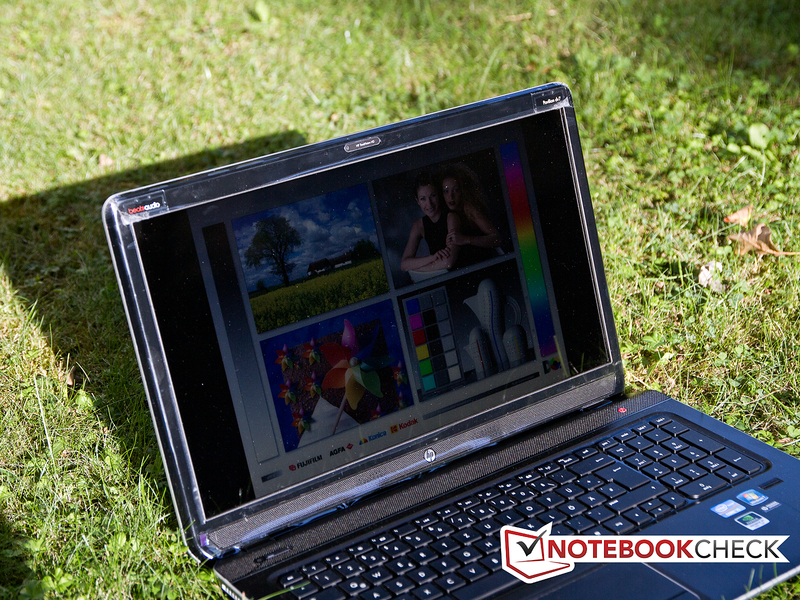 The notebook can be used on the lap while performing office tasks or surfing on the web. However, once a game is running the notebook can get too hot for the lap. Then again, few users will want to play the game in that position. In our stress test, we ran Prime95 and FurMark simultaneously. This test confirmed what we noticed while observing the Turbo Boost function. If the CPU has been running for a while at high levels, the HP Pavilion dv7 automatically reduces the clock speed, which means that the laptop has less performance to offer for the task at hand. The base clock speed of 2.5 GHz drops if the laptop is constantly at high load. After one hour at maximum load, the speed had dropped to "only" 1.995 GHz. The CPU temperature was 94 degrees Celsius (according to the PC Wizard 2012 which is our standard tool and Hardware Monitor did not provide any temperatures). The game and benchmarks run afterwards were not affected and delivered similar results to the ones run while the laptop was "cool". This means that the drop in CPU speed only occurs at extreme load. Of course, the stress put on the laptop by Prime95 and FurMark will be hard to achieve in everyday use. A game which can cause such high loads would be Battlefield 3. However, this game can be barely run fluidly on the dv7 review sample to begin with. (±) The maximum temperature on the upper side is 43.7 °C / 111 F, compared to the average of 36.5 °C / 98 F, ranging from 21.1 to 71 °C for the class Multimedia. (-) The average temperature of the palmrest area of similar devices was 29.1 °C / 84.4 F (-5.2 °C / -9.3 F). HP has picked Beats audio speakers for the Pavilion dv7. This is a familiar brand found in many laptops which promise great things only to end up offering sound quality similar to that of standard notebook speakers. The HP Pavilion dv7 is an exception to the trend and we were positively surprised when the speakers were turned on. The volume is quite loud. 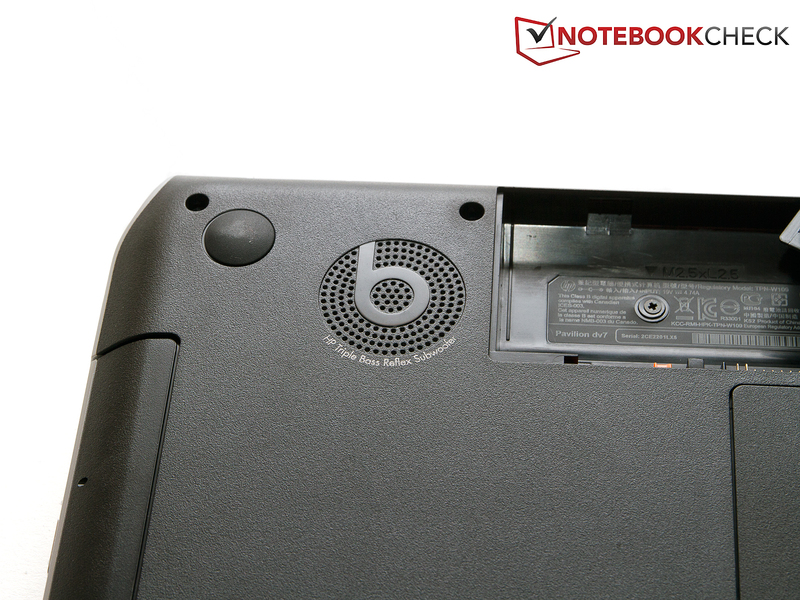 Subjectively, we feel as if the Beats audio speakers at 30% are already as loud as most notebooks at 100%. In addition, the sound is great at all levels. Thanks to the integrated sub-woofer on the bottom, the speakers even offer some bass. Overall, the sound system of the Pavilion dv7 is very good. The Pavilion dv7 requires between 8 and 13.9 watts while idle/during low usage. This is not bad for a laptop with a 17-inch display. As is clear from the numbers, the power-saving mechanisms of the laptop do a good job, especially while it is idle. The dv7 performs quite well, even when compared to smaller notebooks. For example, the Medion Akoya P6633 (2450M, GT 630M) which uses the same graphics card and CPU consumes 10 - 17.8 W while idle. At maximum load, the power consumption is forcibly reduced. On average, it lies at 82 W. However, if the notebook is at full load, the consumption drops to 72.2 W. This is done by throttling the processor (limiting the clock speed). The power adapter should not have a problem with such values. After all, its 90 W specification covers the range discussed in this review. 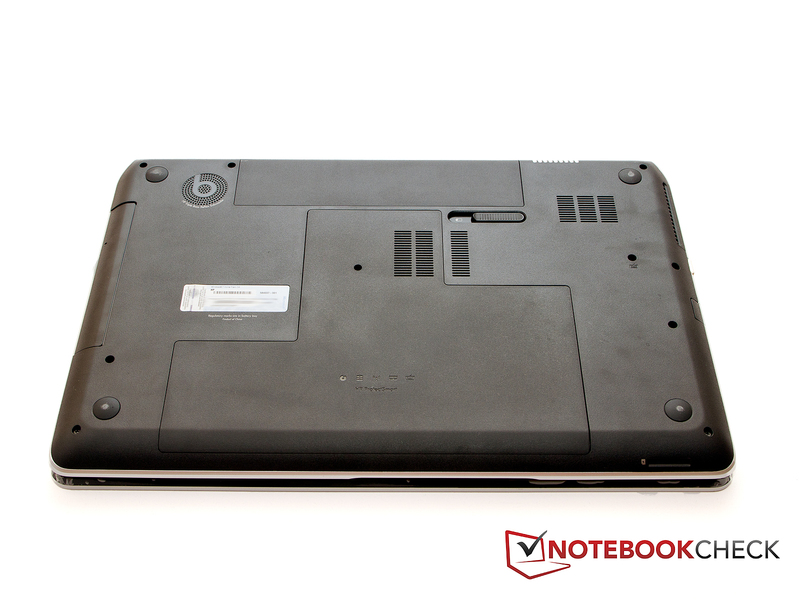 We used the BatteryEater program to analyze the battery life of the HP Pavilion dv7. The maximum run time of our test model was recorded using the Readers test. This test simulates an idle/low load scenario. The notebook lasted a good 8 hours and 17 minutes. However, this test is not very practical, as the notebook is often in standby mode if it has not been used for a while. The WLAN test gives us a more realistic time frame. This test simulates surfing on the Internet with higher brightness and the WLAN module switched on. New webpages and online videos are loaded constantly. The Pavilion dv7 squeezes out 4 hours and 49 minutes in the WLAN test. This is a good run time, and one, which, most everyday users will be able to reach. In the DVD test, the Pavilion dv7 lasts 3 hours and 43 minutes. This is good news for users who wish to watch epic movies on-the-go. At full load, the battery life drops to 1 hour and 24 minutes. The laptop requires 1 hour and 45 minutes to fully recharge the battery. The HP Pavilion scores points in many areas, but it has a few weaknesses which the buyer should know about before making the purchase. The list of advantages includes a case made of aluminum with good workmanship. Although it cannot compete with the workmanship of premier laptops, for the price, the HP Pavilion dv7 offers very good workmanship. 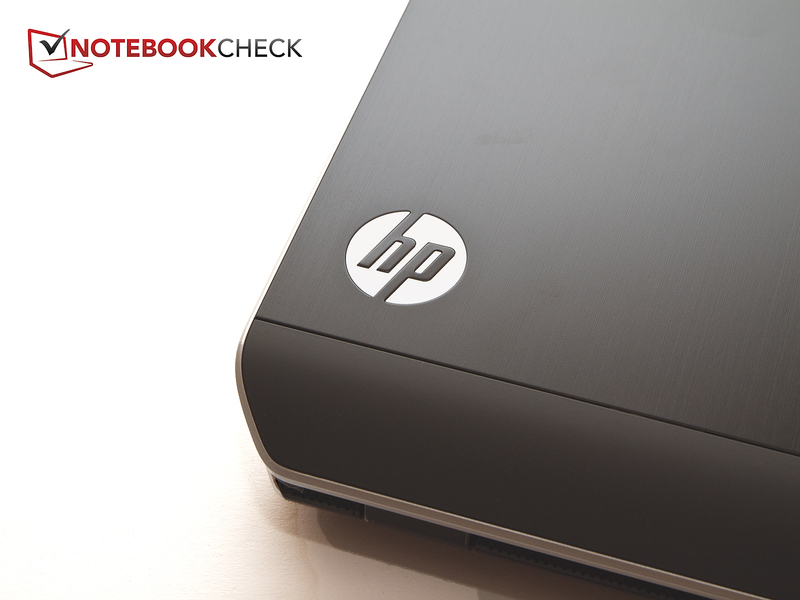 The keyboard and touchpad are comfortable to use, but even here, HP has room for improvement. However, for a multimedia notebook, this combination of keyboard and touchpad is more than sufficient. The display makes matters slightly worse. The brightness is fine and the distribution is great but the poor contrast and the reflective surface are very big weaknesses. We were also bothered by a few points in the performance section. 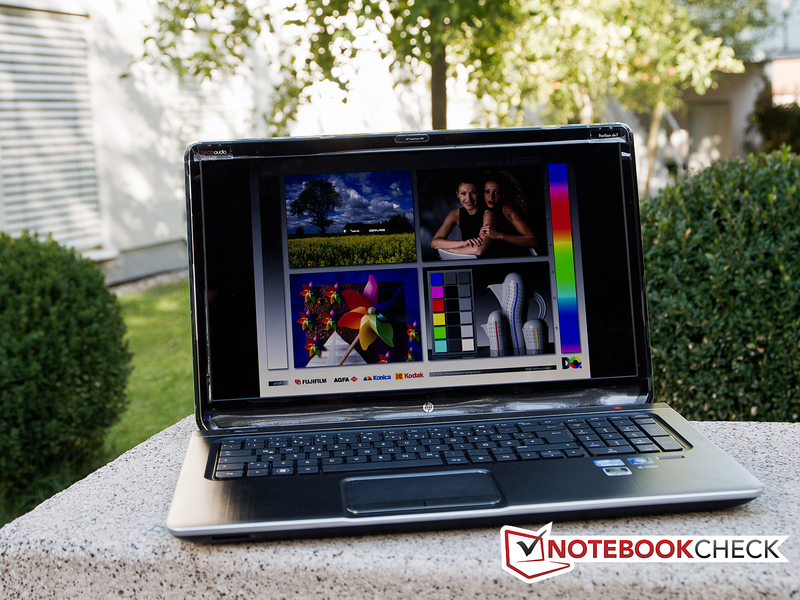 The laptop offers sufficient performance for a multimedia notebook. Yet there is room for more, especially for more graphics power which is important when running games. The limited processor performance at high load is another issue. Despite all this, HP is offering a very solid notebook for a price under 800 Euro (~$1035). The buyer should carefully consider his/her needs before making the purchase. If the Pavilion dv7 7000sg is not good enough, then take a look at the dv7 7001sg (quad-core processor) or the dv7 7002sg (quad-core and a Full HD display). Of course, the price is higher for these models. 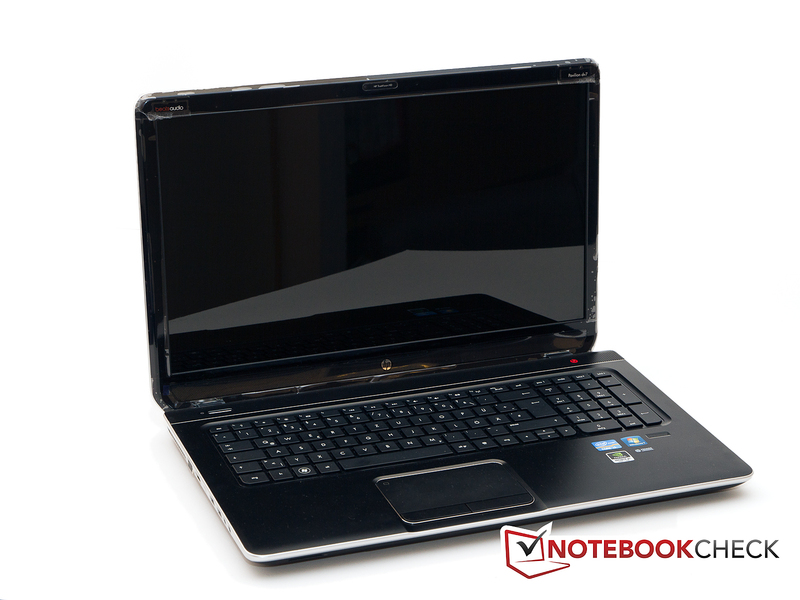 The HP Pavilion dv7-700sg multimedia notebook. 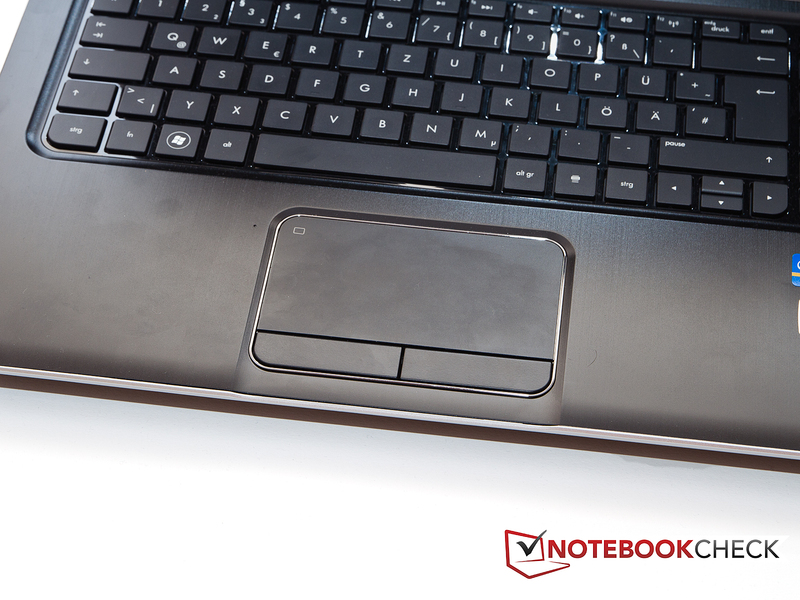 A fingerprint reader protects the laptop from unauthorized access. and the Beats audio sub-woofer. The display is legible in the shadows. and the opening angle could have been bigger. The insides are also made of aluminum. Aluminum makes the case quite strong. The logo lights up when the laptop is on. 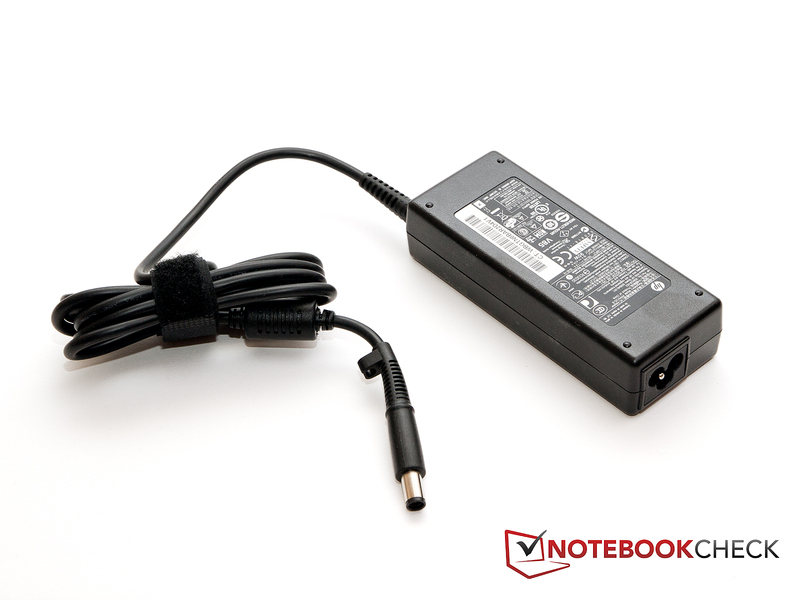 The 90 W power adapter can deliver power to the notebook quite well. The aluminum case and the great speakers. A Full HD matte display and a Blu-ray drive. Unfortunately, this could not fit into HP's budget. The limited performance of the processor at load.